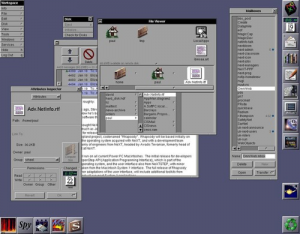 NeXT Computer releases version 1.0 of NeXTSTEP, an object-oriented, multitasking operating system. Originally designed to run on NeXT’s brand of computers, it was later ported to other architectures such as the Intel x86. Often considered years ahead of its time, NeXTSTEP brought to market many advanced features that were not seen together in any other operating system for nearly 10 years. Its powerful object-oriented development environment was also used for the creation of the word wide web. In 1997 Apple acquired NeXT Computer to build their next-generation operating system upon the NeXTSTEP architecture, later named Mac OS X. Today’s iOS that runs on iPhone and iPads is descended from Mac OS X and NeXTSTEP. I had the opportunity to use NeXTSTEP in 1992 for a computer science class at the University of Illinois. I immediately recognized how powerful it was, yet didn’t fully appreciate what I was experiencing until years later. It really wasn’t until the late 1990’s and early 2000’s that other operating systems brought together the power and reliability of NeXTSTEP.